More than 35 years ago, the Alzheimer Society of Calgary was begun by a small group of volunteers led by Jeanne Bentley. These motivated individuals were determined to provide resources and support to families like their own who needed help and support throughout their journey of impact. Later in life, Jeanne, herself, developed Alzheimer’s disease. She became a participant in the programs and support services she established years before. Today we honour her legacy by acknowledging our volunteers and community partners who exemplify the same commitment to service as Jeanne did. Jeanne Bentley was born on August 11, 1932 in Strome, AB. She lived in Calgary and Edmonton and spent time her summers at Maligne Lake near Jasper where her parents worked at the lodge. Jeanne began her career as a secretary in the oil and gas industry until she moved to Lafayette, Louisiana with her husband Bob in 1960. There she gave birth to her daughter Pam and the family moved back to Calgary in 1971. Jeanne was a talented craftswoman, owning and operating Calgary Ceramics for several years. Her many gifts included sewing, ceramics, knitting, tole painting, cross-stitching, golfing and gardening. She even lent her vocals to sing as a soprano in her church choir. Jeanne was an avid volunteer as a Brownie leader (in both Louisiana and Calgary) and gave her time generously to the Mustard Seed. 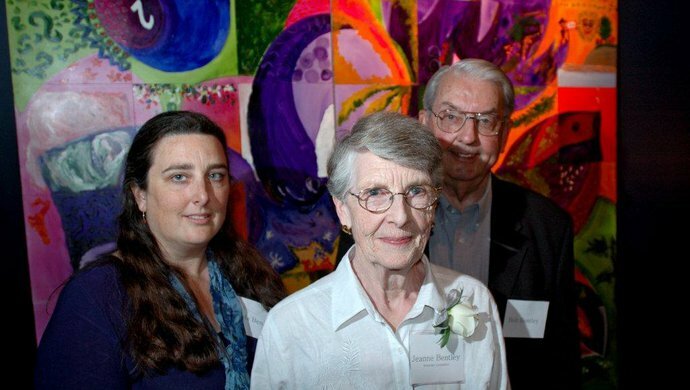 After her father was diagnosed with Alzheimer’s disease in 1981, Jeanne and ten other care partners founded the Alzheimer Society of Calgary. She served in many capacities over the next 20 years, including becoming president of the Alzheimer Society of Calgary and the Alzheimer Society of Canada. In 1988 Jeanne was recognized with the Louise Dean Award for top volunteer in Calgary. The Alzheimer Society of Calgary has since established the Jeanne Bentley Awards in her honour to recognize outstanding volunteer contributions to the community.